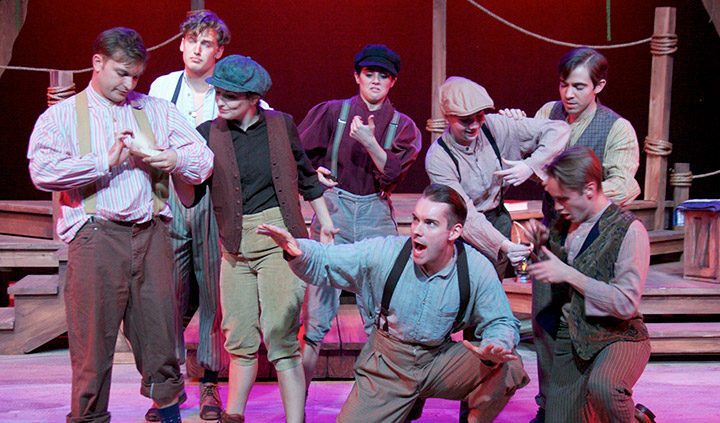 The (seven) Tony Awards-winning musical ‘Big River’, based on Mark Twain’s The Adventures of Huckleberry Finn, opens Saturday, June 8 at Pagosa Springs Center for the Arts. One of those 1985 Tony Awards went to Roger Miller for best original score. What better way to spend time after our July Fourth celebration than to immerse one’s self in this historical musical about Huckleberry Finn’s adventures, American slavery, and freedom? “You don’t know about me, without you have read a book by the name of ‘The Adventures of Tom Sawyer,’ but that ain’t no matter. That book was written by Mr. Mark Twain, and he told the truth – mainly. “There was some things he stretched, but mainly he told the truth. And I’m going to tell the truth, as I see it, in the story I’m enacting tonight. That journey centers around their float trip down the Mississippi River aboard an abandoned raft, and all their adventures and misadventures – some hilarious and others frightening – along the way. 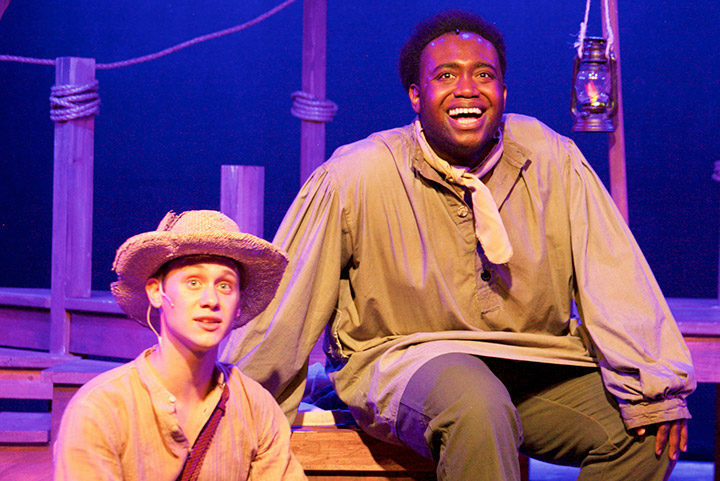 Stuart Rial as Huck Finn, and Tyler Price as Jim in ‘Big River’. All photos courtesy Elly Osmera. Huck Finn is a wild-child orphan (his Pap doesn’t qualify for the title of parent) without a visible compass, but, as the story unfolds, his inner compass points towards character and heart, and the realization that slavery is unjust, inhumane, and immoral. However, the path is not a straight line, and that is what creates drama and dramatic comedy along the way. The delightful and many times soulful music and lyrics for ‘Big River’ were written by the brilliant country singer and songwriter Roger Miller. Former Yale School of Drama professor Rocco Landesman convinced an intimidated Miller that he could and should write a Broadway score for Twain’s Adventures of Huckleberry Finn. In typical Roger Miller fashion, he joked, “He (Landesman) made me an offer I couldn’t understand.” Miller considered the ‘Big River’ score his greatest musical accomplishment. He related to the character Huck Finn, and the language, because it was reminiscent of his own rural Oklahoma childhood. After Miller came on board, Landesman commissioned fellow professor William Hauptman in 1983 to write the book for ‘Big River’. Hauptman strived to remain true to the language of Twain’s novel, and so included selective racist language, including the N-word. However, Hauptman re-examined that language in 2010 after he saw an excellent revival of ‘Big River’: “I felt that Twain’s lesson has now been learned so thoroughly that even my selective use of the word seems excessive. It would not do to eliminate the (N-word) entirely – I have to be true to the world of Twain’s novel or we can’t have Huck’s conversion – so I’m suggesting that half the uses of the word be eliminated or altered.” Hauptman’s suggested revision of his original book is reflected in Thingamajig’s ‘Big River’ production. Twain’s 1885 novel The Adventures of Huckleberry Finn included the N-word 219 times. It was first banned just one month after its publication as “not suitable for trash”, and has enjoyed a notorious and controversial place in American literature since then. Does it promote racism through the use of the N-word, or is it a tool to educate modern America? A 2011 revised edition of the novel replaced all occurrences of the N-word with “slave”. That choice has been the subject of even greater controversy. The diverse cast that Thingamajig Theatre’s artistic director Tim Moore assembled for the 2017 summer season could be the most talented cast ever at PSCA. ‘Big River’ stars Stuart Rial as Huck Finn, and Tyler Price as Jim. I attended rehearsal for two songs. “The Boys”, led by trouble-maker Tom Sawyer (Luke Hefner) is a song I would coin as fantastical fun. In contrast, the vocals and understated but powerful choreography (Paul Thiemann) for the song “Free at Last”, sung by Jim and Slaves, was deeply moving. Roger Miller’s ‘Big River’ score ran the gauntlet, and proved the veracity of a tribute at his 1992 celebration of life – that God made Roger Miller equal parts laughter and soul. 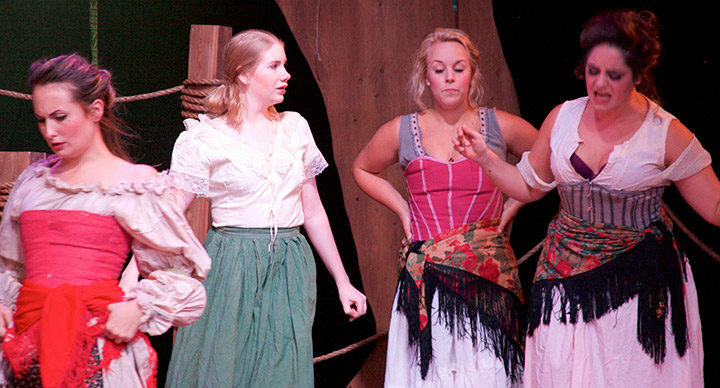 ‘Big River’ director Anita Jo Lenhart is passionate about this production, and has emphasized the diverse, talented cast. 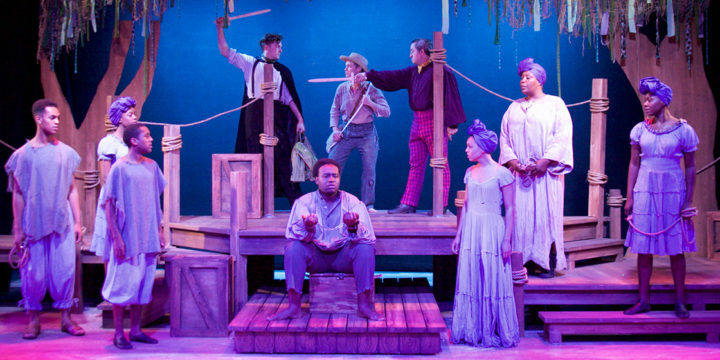 “Our artistic team has developed the ‘role’ of what we call the Spirit Ensemble (all the actors of color who play slaves in ‘Big River’) as an elemental force connecting heaven to the earth… we think of them as a guiding and protective spirit for Huck, like the water spirit of the Mississippi. 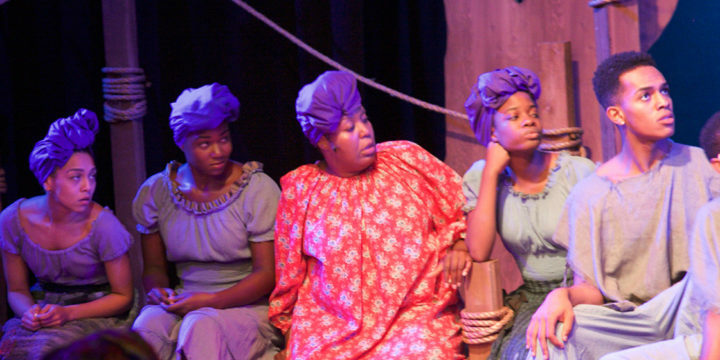 ‘Big River’ plays in repertory throughout the summer with three other summer season musicals: ‘Aida’, ‘Hairspray’, and ‘Sister Act’. For tickets or more information, click here, or phone the Pagosa Springs Center for the Arts, 970-731-7469. Big River presented by Thingamajig Theatre Company: Music & Lyrics by Roger Miller; Book by William Hauptman adapted from the novel by Mark Twain; Directed by Anita Jo Lenhart; Starring Stuart Rial & Tyler Price; Scenic Design by Nick Kargel; Lighting Design by Laine Wong; Sound Design by Hannah Shutt; Music Direction by Boni McIntyre; Choreographed by Paul Thiemann; Costume Design by Adrienne Young; Properties by Tanya Quinn; Stage Management by KC Caimi. Thingamajig Theatre is a professional nonprofit 501(c)(3) theatre in residence within the Pagosa Springs Center for the Arts producing musicals, comedies and dramas year-round.